In the year 2050, my son will be 38, around the age that I am today. Montserrat would have just completed its most critical years.Â How would our beloved island have fared? How is Montserrat fitting into this highly robotic world? Is our island still inhabited?Â Is our culture still alive and thriving? Are our children and grandchildren enjoying and living up to their true potential on this land? Is our nation happy; our workforce motivated and productive?Â Is our island self sufficient? These are just a few of the questions I ask myself. Veta Wade Photo of Montserrat from Silver Hills. The Â next set of politicians that are elected to serve this country,Â must also ask themselves similar questions. Under Mr. Reuben Theodore Meade’s Sustainable Development Plan 2008-2020 we carved a path out of volcanic crisis, but perhaps what was missing from this plan was national aspirations and a clear vision. Not surprisingly, as the mood of the day would’ve been simply survival. The result is that over the last 20 years key development goals were left underachieved. For now, as a nation we must be realistic and yet aspirational. Our island will face huge developmental challenges. Montserrat is constrained by a small and dispersed populations with no economies of scale. We have low bargaining power with suppliers and overall inefficient transport / access infrastructures. Island projects are mostly small-scale and may thus be overlooked by international investors. We are totally dependent on aid and our funders may have lost confidence in our politicians.Â As if those are not sufficient challenges on our doorstep; Â we also have Ms. Soufriere in our backyard. That being said, my Granma taught me ‘where there is a will, there is a way,’ and life has proved this to be correct. As a Montserratian, whose future and business is completely dependent on how we prosper as a nation, I wish to put my thoughts on record as to how I believe our next 30 years should be considered. 1. Create our Vision – Make Montserrat a Green Nation. The environment is our greatest asset. Our natural environment and our people must be prioritized.Â The idea of being ‘green’ does not just mean the environment, it should be our way of life.Â We need to draw upon innovative and environmentally friendly ideas that will earn government revenue to serve our collective needs. Green initiatives like extracting and distributing our natural spring water must be pursued, considering that freshwater is seen as a critical issue globally, both in terms of water quality and quantity. 2. 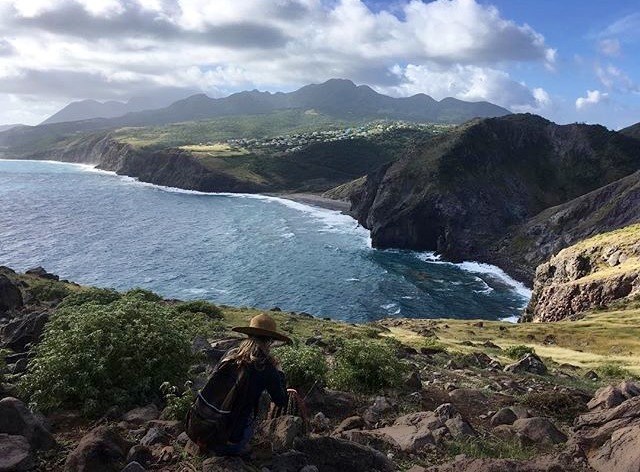 The Fight against Climate Change.Â Islands like Montserrat, 13 sq miles habitable with Â approximately 4000 people are not responsible for climate change, yet we are the among the first to suffer from its effects and have few resources to defend ourselves. Hurricanes Irma and Maria both pounded the Caribbean last month.Â Some believe that only large nations can fight climate change; but in fact each country, no matter how small, can make a positive contribution. Montserrat must not only play its part but lead on the front lines. Each of us is responsible for the welfare of the planet, for one another and for future generations. Am I my brotherâ€™s keeper? Yes, I am. We all are. And it is time for the world to heed natures wake up call and to take action against climate change. We must join forces and build partnerships regionally and globally to achieve this goal. The development of adaptation measures in response to climate change may provide an appropriate avenue to integrate both local and global forces towards island development that is sustainable. Regardless to our size, if we adopt a strong Green Development Strategy we could draw upon the skills of thousands in our diaspora and beyond. 3. Educating our children will be critical. There should be a policy to change schools to ” Green Schools”. Alongside maths and science, children should be taught basic agricultural techniques and environmental protection and green technologies should focused on. Education doesn’t just mean getting good grades, it means preparing our children to be good human beings. This next generation is going to face a very scary world as their environment changes and social pressures increase. We need to prepare them for this. Our young people must be ready for leadership. They must be mentored and fast tracked into senior management within our civil service, and their private sector initiatives supported. Through travel and education, we must invest in our youth. Whatever decisions we make today, it is they who will have to live with the consequences. 4. Our citizens mental wellness.Â We must create a new and more holistic approach to development and national health .Â A successful nation, focused on meeting its sustainable development goals depends on a productive and healthy workforce.Â Therefore, it is fundamental that our nations mental wellness should be one of our main aspirations. Wellness is a relatively a new paradigm in health care. It has been best described by Dr. Jane Myers of the University of North Carolina as a way of life oriented to optimal health and well being, in which mind, body and spirit are integrated in a purposeful manner, with Â a goal of living life more fully. 5. Cultural Preservation. Today, it is clear that our need for cultural preservation is now at its most critical stage. Our population is aging, our people displaced, our youth migrating outwards, our non-national populous could outgrow our nationals even as early as 2020!Â Arguably, no other area has taken a harder hit over these past 20 years than ‘our Â culture’. If we don’t have our culture, how do we know who we are? How do we make decisions for our future generations? We must educate our citizens to see that our traditional lifestyles are far more helpful to our survival than the commercial conveniences we Â aspire to now. It is my belief that it is integrity and honest intention to see our island thrive that must win this next political race. Montserrat has no time for political mudslinging, and unnecessary rhetoric; its unity, sacrifice, hard work and foresight that will bring the results we are all so desperately need. What part will you play?